Who is angel Uriel? Experts in metaphysical lore believe that He is the Angel of Peace. They also believe that Uriel is one of the seven archangels who stand before God. The name of archangel Uriel comes from Hebrew and it can be translated as "the light of God", "the flame of God" or "the fire of God". As a child, I attended Catholic schools where I was introduced to the archangels. However, I learned little about Archangel Uriel. I knew a lot about Michael, Raphael and Gabriel – but not much about Angel Uriel. This was due to the fact that the Catholic Church currently does not recognize Uriel as an archangel. Later in life, I would be reacquainted with Uriel and learn of his work on the Sixth Ray. Interestingly, I've had a hard time finding early works of art depicting this fiery archangel. Clearly, Medieval Christian art was mostly focused on the best-known (or officially recognized) archangels and other spiritual themes taken from the scriptures. 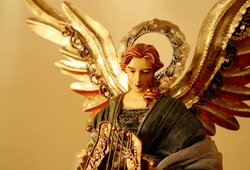 So who is Uriel The Archangel? Uriel is not mentioned by name in the canonical texts that make up the official Bible. However, he does appear in Jewish texts, Kabbalistic traditions, Christian apocryphal gospels, Gnostic texts, and even literary works. Angel Uriel appears in two Christian apochyphal gospels, including the Second Book of Esdras. This text follows the prophet Ezra as he asks God a series of questions. God sends Uriel to answer Ezra’s questions and to instruct him on the meaning of evil. Uriel also appears in The Book of Enoch, which says that he is "one of the holy angels, who is over the world... the leader of them all." In this book, Uriel is also presented as the angel who warns Noah about the flood. Apocryphal texts also describe Uriel’s role in the rescue of Jesus's cousin John the Baptist from the Massacre of the Innocents, which was ordered by King Herod. Uriel helps John and his mother, Saint Elizabeth to flee into Egypt. There they would join Joseph, Mary and Jesus. This reunion is depicted in Leonardo da Vinci's masterpiece Virgin of the Rocks. Medieval Christian theologian and philosopher Pseudo-Dionysius lists Uriel as one of the seven archangels, the other six being Michael, Jophiel, Chamuel, Grabiel, Raphael and Zadkiel. By the way, here's an article about angel hierarchy and about Pseudo-Dionysius' influence on angelology. Uriel also appears in Jewish texts. According to the Jewish Encyclopedia and based on Jewish mystical traditions, Uriel is considered the Angel of Sunday, the Angel of Poetry and one of the Holy Sephiroth (holy attributes in the Kabbalah through which God reveals himself and continuously creates everything in the universe, both manifest and unmanifest). As a literary figure, Angel Uriel has also left his mark. In John Milton's, Paradise Lost, Uriel is referred to as the "Regent of the Sun" and plays a role in the fall of man. Currently, the Roman Catholic Church does not recognize Angel Uriel as either an archangel or a saint. However, he was venerated in the early days of the church. What prompted this change? Apparently, early Christians venerated Uriel so much that the Church worried it was turning into a cult. In an effort to stop angelolatry, Pope Zachary removed the two apocryphal books that mentioned Uriel by name. This occurred at the Council of Rome in 745. With this action, the pope stripped Uriel of his title of archangel and any possibility of him being officially revered as a saint. However, many Catholics still venerate Angel Uriel to this day. The Anglican Church honors Uriel the Archangel as the Patron Saint of the Sacrament of Confirmation. He is honored along with the other archangels during the Feast of the Archangels, also known as the Feast of Saint Michael and All Angels (September 29). The Coptic Church observes Uriel’s official feast day on July 28. The Eastern Orthodox Church venerates Uriel along with Michael, Gabriel, Raphael, and Uriel. This church celebrates The Feast of the Archangels on November 8.
of the Sacred Heart of Jesus. may bear much fruit in our souls. that we may fully participate in the army of the Church. According to the Teachings of the Ascended Masters, Uriel is the Angelic Director of the Sixth Ray - also known as the Gold-Ruby Ray or simply the Ruby Ray. In his capacity of Angelic Director, Uriel and his consort Grace (also known as Aurora) are in charge of providing supply in any form: material, emotional, mental, or spiritual. Since the Ruby Ray is also the ray of peace, Uriel is also the angel of peace. He is also the angel of ministration, service and divine grace. If you need money or any other type of supply, call upon Uriel and his ministering angels. In you are amidst confrontation, stressful situations, are having relationship problems, or need help with any kind of conflict, ask Uriel to bring peace to your heart and/or the situation. This page has more about the Seven Rays and the Ascended Masters' teachings. In modern angelology, Angel Uriel is sometimes depicted as a cherub. Other times he’s described as being a seraph. Uriel is also known as the regent of the sun, the flame of God, the fire of God, and the overseer of the Tartarus (or Hell). I hope this article helps you get to know Uriel a little better. If you want to explore the world of angels and archangels a bit more, please visit the following pages.